How can we help you today? Send a message online or give us a call at 203-777-1234. We hope to serve your family soon. Change can be disruptive, even life-threatening for an elderly person. Opting to help yourself or a loved one "age at home" with Aides and Companions can be therapeutic and beneficial. Aides and Companions home care was created by a geriatric nurse with years of elder-care experience. Our experience confirms that with compassionate supervision there is no place like home for the elderly. Aides and Companions home health aide professionals can keep the elderly safe and comfortable in surroundings that have sustained them throughout their lives. 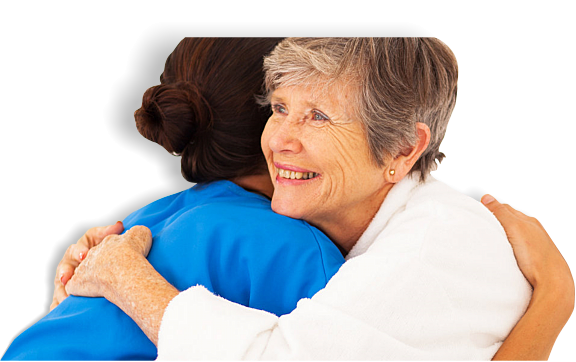 Aides and Companions home care treats each case on an individual basis. We're flexible. Our professional care givers can be assigned to assist at home for a few hours a day or around the clock. Our aide arrives around supper time, prepares dinner and then readies everything for bedtime. They stay overnight and in the morning make breakfast and prepare you or your loved one for the day ahead. In the case of chronic illness or Alzheimer's, we can assign two of aides for around-the-clock home care. They administer medication, attend to personal hygiene as well as lend emotional and physical support. If you or a loved one is recuperating from a long illness or a recent surgery, our short-term care will see you through to recovery and help get you or someone you love back on their feet sooner than later. If you're a care giver yourself, you need to time away from your responsibilities to recharge and refresh. Our Respite Care can fill in for you on a daily or a weekly to give you peace of mind while away. Our live-in care professional are dedicated to providing the support you or a loved one needs. They're trained, bonded and carefully vetted to ensure clients receive the most compassionate care possible. Home care by Aides and Companions can be a low cost alternative to more expensive assisted living programs. We work to ensure our clients stay safe and healthy at home. We can help to identify needs before they become difficult and expensive to resolve. Unlike most home care agencies, Aides and Companions care-givers are all Certified Nurses Aides or Home Health Aides. All are graduates of state-certified programs and receives monthly “in-service” training to keep their skills honed. Our counselors welcome the opportunity to meet with you to perform a free no-obligation evaluation. We understand every situation is unique. We will provide services according to your schedule and when you need them most. We can provide care from two hours to 24 hours a day. Our caregivers are Aides and Companions employees. Each is highly qualified, carefully selected and thoroughly screened, bonded and insured. Allowing you to remain safe and secure at home.Aides and Companions comes out of a tradition of geriatric nursing. We believe in-home care is superior to and healthier than institutional care. We provide the kind of one-to-one care an elderly person needs to continue living a comfortable and healthy life in familiar surroundings. We are committed to making every moment a client is in our care a safe and comfortable one.